In the Island of La Hispaniola, Santo Domingo in the Dominican Republic has the priviledge of being the first City in the Americas. Officially the city was founded on August 5 1496, only four years after Christopher Columbus first came to the “New World”. On the shores of the Ozama River several building where erected, such as the “Alcazar de Colon”, the “Fortaleza Ozama”, The First Cathedral in the New World, a Dominican Friars’ Convent, among others. What do all of these projects have in common? They all use Coral Stone as their building stone. Geographically, Santo Domingo is situated on a bed of Fossilized Coral Rock so it was easy for builders during construction, to quarry Coral Stone boulders from nearby quarries. Since Fossilized Coral Rock is a very young rock, geologic speaking, it was also a very abundant ingredient for the pozzolanic cement. Coral Stone was use not only as boulders for the construction, also in common use areas such as sidewalks made by laying Coral Stone Pavers. Although one might think that landscaping was not an issue back then that would be wrong. All house constructed during that period had an interior patio which normally where normally made as Coral Stone Landscape Tiles. Also other architectural elements where made of this stone, just to mention a few, Coral Stone Columns, Balustrade, Coral Stone Trims, Coral Stone Fountains, etc. Now you can use this beautiful Fossilized Coral Rock for your projects, LMT International is a provider of Dominican Coral Stone Tiles, Dominican Coral Stone Pavers, Columns, Balustrade, moldings, etc. 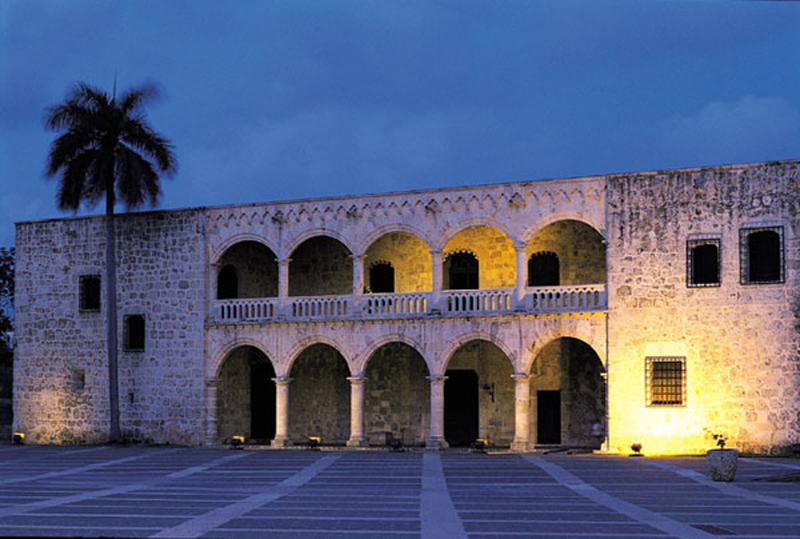 Most of the façades in Santo Domingo were made with Coral Stone and you can use this too. For more information on all of our wonderful products please contact us, we will gladly offer you the best possible solution for your project needs. At LMT International, we have dealt with all sorts of projects imaginable in Coral Stone and other limestones, BUT our biggest pride is that most of our customers have become more than that, they have become FRIENDS. During our 9 years of operations traveling and working all around the world, is that the number of friends has grown. LMT International, prides itself on literally being INTERNATIONAL, we have supplied countries in almost all the continents including Asia, America, Europe, Middle East, and Australia. Our commitment to our customers is that our commercial relations withstands the test of time and as with our stone, becomes long lived. Our goal is to achieve that when you think about coral stone, you think about LMT International. Please let us know how we could be of service and it will always be a pleasure to help your projects and dreams come true.